Beautiful fly tying lap try, special designed to be used on your lap. ​Weighing about 1.825 kg just over 4lb. ​This model has a 4 well holes for varnish, Bug off and stackers . The vice shelf specially position to take a vice at the back for lap use or at front for bench use. 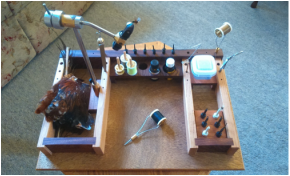 Fly tying try, special designed to be used on your lap. ​Weighing about 1.824 kg just over 4lb. ​Ply base with - Light coloured Chestnut rails to form side tray and back edge tool support. Dressed with burned flies and predrilled with different size holes. This model has a 4 well holes for varnish, Bug off and stackers . 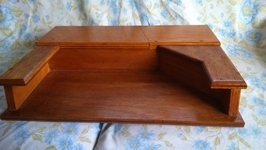 The vice shelf specially position to take a vice at the back for lap use or at front for bench use. Finished with Tung oil and then shellac sealed. Ex Demo (on display only once). 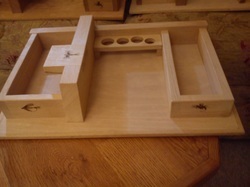 Fly tying tray, special designed to be used on your lap. ​Weighing about 2.224 kg just over 4lb. ​Ply base with - Harwood storage area at back of tray. The top swings open to allow access to storage area. ​The left side has a built in vice clamp and the right side will accommodate a left hand vice. 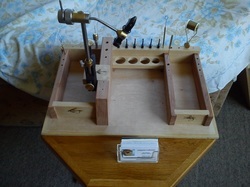 ​This section also swings open to allow a triangle shape varnish well and tool holder to be kept. The stop lid turns over to provide a thread and varnish holder or the other side provide more clip holding space. Excellent desk unit, folds away to keep everything tidy when not in use! 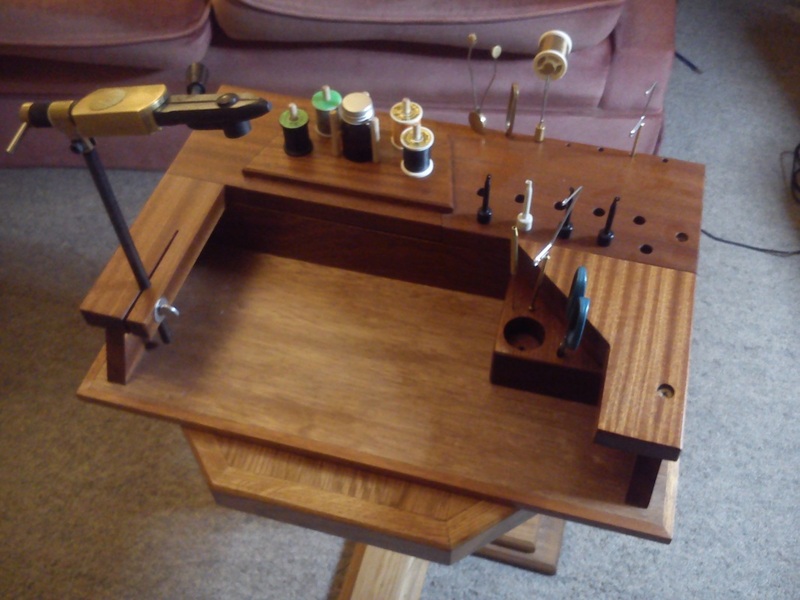 This Ply Fly Tying bench is a sample model and ex demo. Shellac finished to give a nice work surface. Designed to give you two sliding draws for storage under the back shelf. The draws are locked in place with the centre lift of lid! The centre lid has two varnish well recessed in. The front right side has a top that swings open to allows a triangle shape tool holder and dryer to be stored. ​As a ex demo item - Retail £85 - Reduced on Sale £60.00 plus £14.00 postage & Packaging. 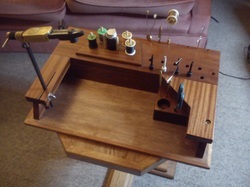 This latest tying lap bench is Ply based with chestnut side panels. The main back and front panels are in a old piece of Mahogany (Brilliant to find this piece of Mahogany amongst some old pallet supports and give it a new life). The Mahogany is dressed with burnt 4 flies. It comes with 6 small clips for trout flies and 6 larger clips to hold larger Salmon hooks. Also included is a plastic storage pot, ideal for extra hooks or for those extra flies tied. he middle has holes recessed for bottles and stackers. Also pins for thread and wire reels. It comes with 10 small drying display clips– The top is drill with holes to take different tying tools. Size 467 x 320 x 100mm to the top of the pins. Weight 2.150 kg nearly 5lb. 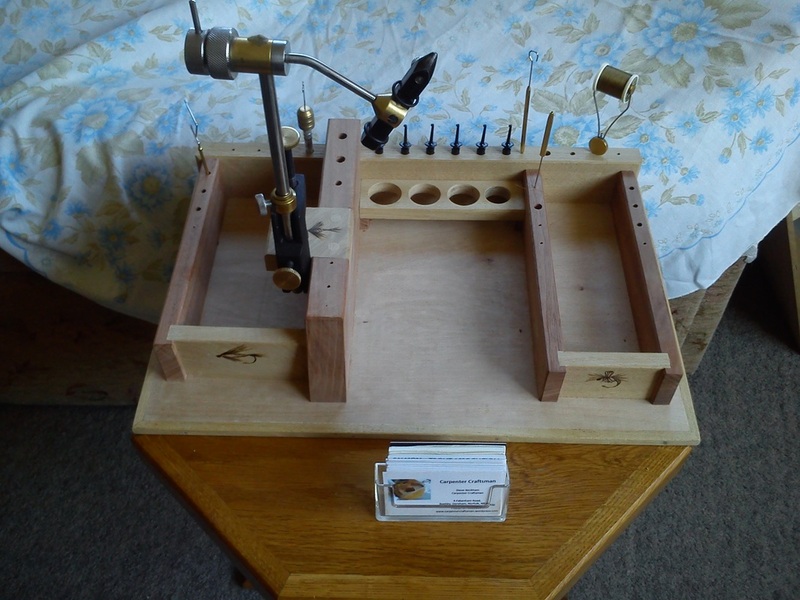 The stand has a fitted brass vice clamp that will take most width, and is positioned for a right-hand fly tier. Left handed desks can be made if required using different materials.